Story: Jereb was one of the inhabitants on a Chakran world which was attacked by the Creed, led by Pitt . Something happened during the attack and Jereb ended up in Pitt's subconcious mind as transcient energy . Here he stayed until Zoyvod attacked Pitt and Timmy. By transferring his conciousness to Timmy, they were able to defeat Zoyvod. The strain was apparently too much for Timmy who went into a coma . Rai-Kee healed Timmy shortly after and Jereb vanished into Shimmerspace . In Shimmerspace Jereb came to exist in non-linear time where he was last seen showing Pitt parts of possible futures . 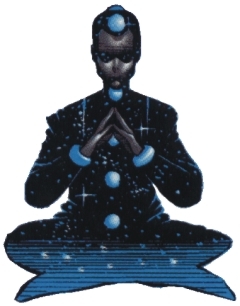 Skills & abilities: Psionic powers.